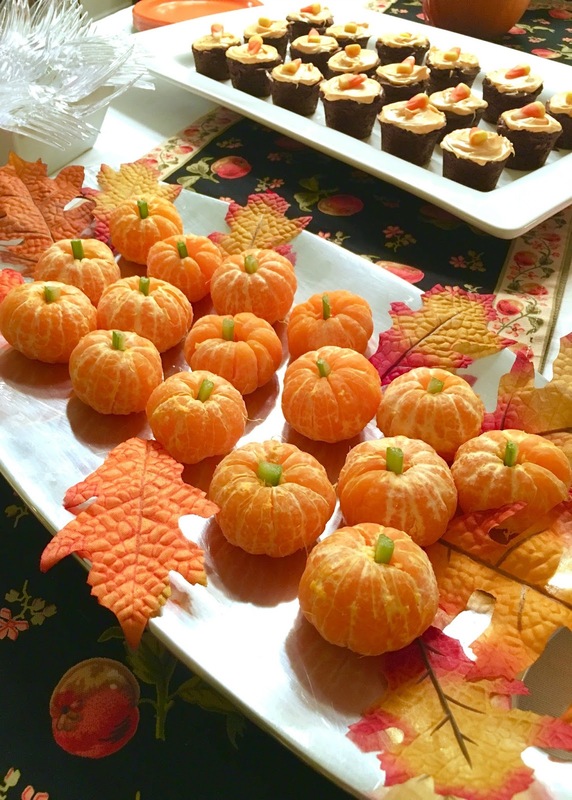 Pumpkins are my favorite Halloween themed object because they are so versatile. My kids are in love with pumpkin activities lately and our house is covered with the pumpkins in all shapes and sizes! I especially love pumpkins that have bumps and color variations. They are so cool. After eating pumpkin treats last night and helping host a pumpkin themed baby shower (scroll down for a few pictures), we put together this simple pumpkin number toss after we ate a few too many leftover pumpkin whoopie pies today! 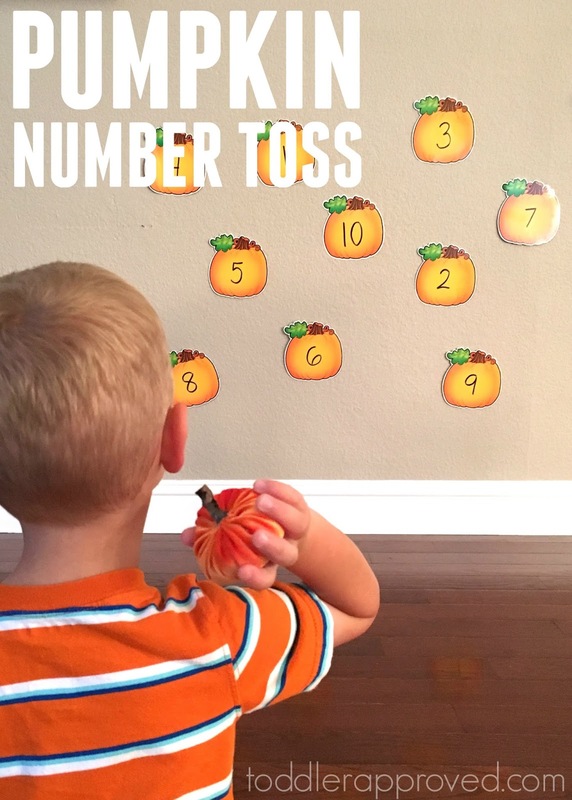 Our pumpkin number toss is super easy to set up. 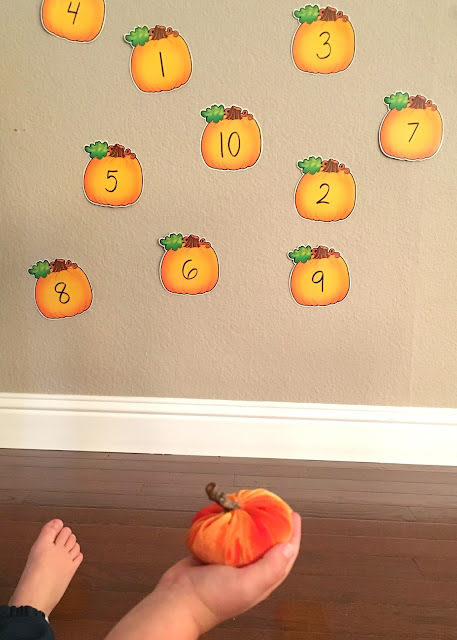 Just grab some pumpkin cut outs, write numbers (or alphabet letters) on them, and then stick the pumpkins on the wall using painters tape. 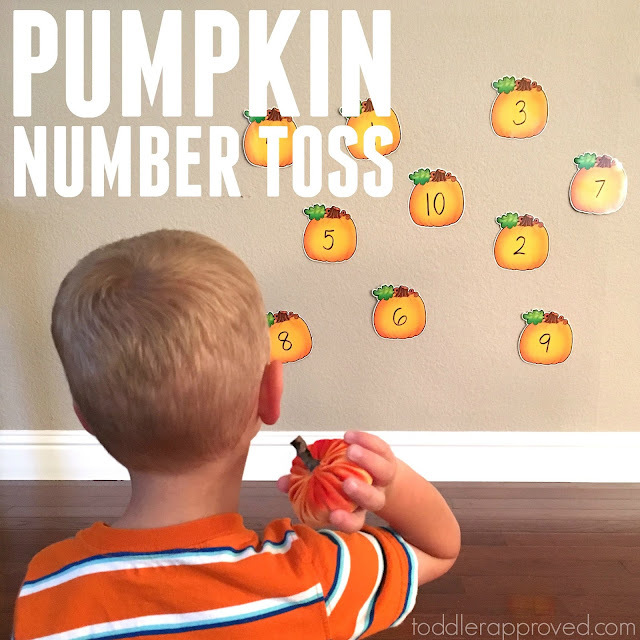 To play we just call out a number and try and hit it with the ball/pumpkin. The winner is the person who hits the most numbers (or letters) consistently. Younger kids just throw the ball/pumpkin at the wall and call out the name of what they hit. The game is easy, active, and fun! My son sat and threw the ball and then also moved around and got closer and further away to try and hit things. The baby also got involved and wanted to join in. 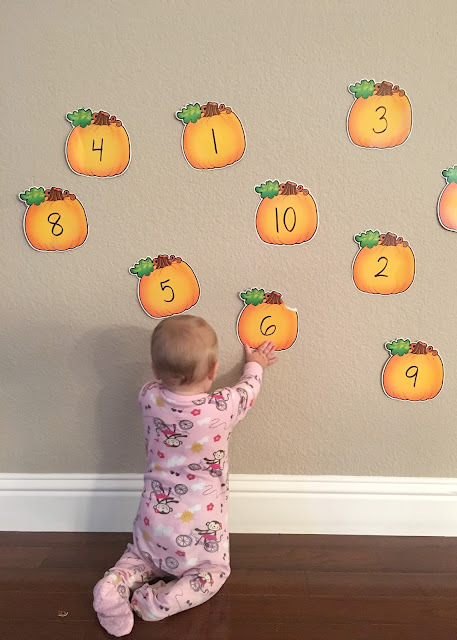 Her favorite thing to do was rip down the pumpkins and then try and eat them. We kept putting them back up and then she would rip them back down again. It was pretty funny and she loved it! She managed to snag a corner of one of the pumpkins and eat it, but other than that, the rest stayed intact. 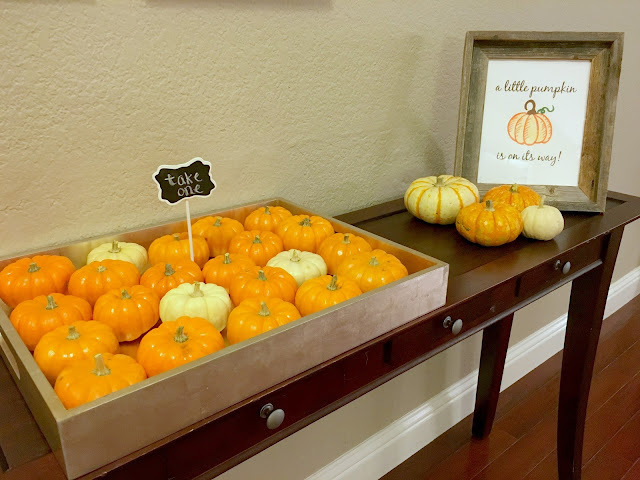 Continuing the pumpkin trend, here are a few quick peeks of the pumpkin baby shower I hosted the other day with two friends. It was so fun! Acorn cookies. These are so adorable and so yummy! The cutest table decor that my friend made! She made two pumpkin babies and they were darling! 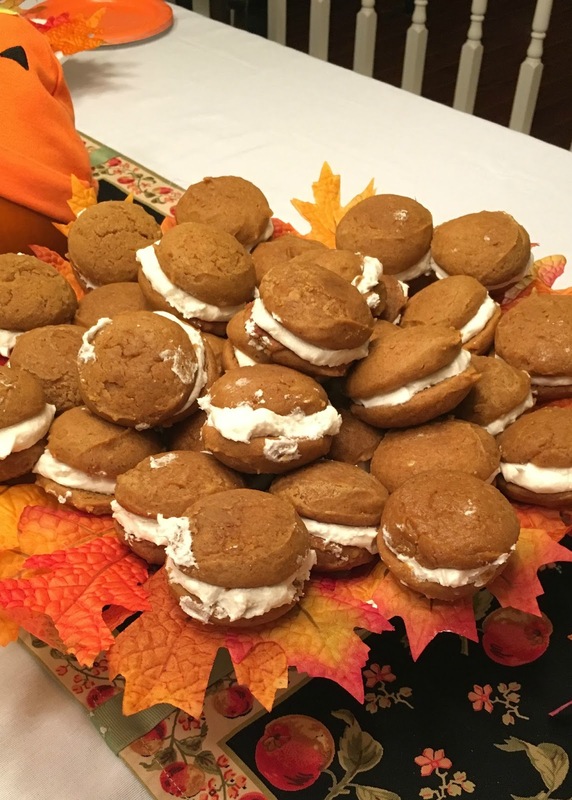 I'd love to hear about any other favorite pumpkin activities you like to do during the season. Do you have any? Do you have any favorite pumpkin books? Come tell me about them!